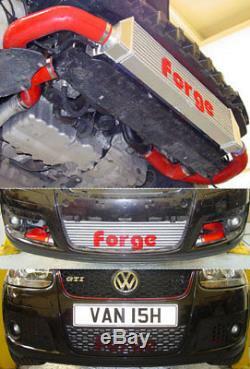 Forge Front Mount Intercooler Kit Volkswagen Golf Mk5 GTi FSiT 2.0 Litre Turbo FMINTMK5. Forge are pleased to present the all new Golf 2.0 L FSIT "TWINtercooler" this ground breaking innovation features Forge's unique twin-core design which has added greater efficiency throughout the entire RPM band beyond that of a single core setup, Forge have achieved this by using the latest core technology with high flow end tank designs to achieve a huge reduction in inlet temperatures. Forge have spent many months testing various designs and the Twintercooler design emerging as the clear winner. This is a bolt-on kit that retains the use of the OEM intercooler to produce both horsepower AND torque, but more importantly, a HUGE reduction in inlet temperatures and increased flow efficiency. A reduction in temps of up to a peak of 20 degrees Fahrenheit from 102 to 82 at 6600 RPM! While the horsepower figures themselves are impressive enough, this will undoubtedly vary from car to car under various circumstances, but such a large reduction in inlet temps is difficult to achieve. Once again Forge have a produced a product that truly is Engineered for performance. Please note: If your vehicle has been supplied to "Hot Climate specification" and has the extra radiator in the front of the wheel arch this intercooler upgrade WILL fit your car. This kit can be supplied with either Blue, Red or Black hoses. Failure to do so will result in your order being delayed. The Intercooler will not have the Forge logo on the front as shown unless requested. Cheques (allow up to 10 days for cheques to clear before goods are sent). However, this right does not apply to items that have been altered upon request, have missing labels or show signs of being used. If you wish to return goods using this right, you need to inform us within 21 days of receiving the goods. You must take reasonable care of the goods and immediately return them at your own expense. Please ask for a "Proof of posting certificate" as we cannot be held responsible for goods that go missing whilst in transit. If you think weve sent you the wrong item or size, please double check the full description in the listing, including the UK size before requesting a return. The item "FORGE FRONT MOUNT INTERCOOLER VW GOLF Mk5 GTi TURBO FMINTMK5" is in sale since Thursday, January 20, 2011. This item is in the category "Vehicle Parts & Accessories\Car Tuning & Styling\Air Intake & Induction\Intercoolers". The seller is "motorbling" and is located in GB. This item can be shipped worldwide.